When caring for a handicapped bird, we must take into consideration the type of disability it has. If a bird is blind but is otherwise healthy, keeping everything in the cage and surrounding area the same is very important. Providing extra perches so that he cannot fall through to the bottom is crucial. And padding the bottom of the cage with towels is very helpful in case he does fall. If he is able to fly from place to place by judging distance and direction, again, don’t move anything. They do very well as long as nothing is moved. Birds with multiple handicaps must have all of their needs met at the same time. Most handicapped birds suffer from wing and/or leg issues, so this article will deal with those. When dealing with a crippled bird, outfitting the cage can be a challenge. I have four special-needs cockatiels. Bonnie is a female lutino who is old, blind, and crippled. She flies very well, and can get from the counter to the orbiter without difficulty. Outside of that, she’s either with one of us, on a piece of furniture, or in a cage. Ernie, an older male normal, is missing his wingtip, so he cannot fly. The tip bleeds easily should he injure it trying to fly down to the floor. So we must try to falls by putting him on the floor when he indicates he wants to be there. He climbs well and has no other difficulties. Winnie, a very old male normal, just came to us. He is unable to bear weight on his one leg. And Marcie cannot fly due to lack of quality remiges and rectrices (wing and tail feathers) and weak wing muscles. She also has skin and feather issues so must be in a collar at all times to prevent picking. 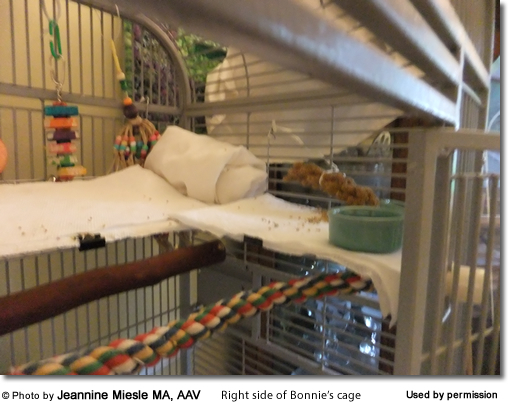 Bonnie is in an HQ cage which is quite roomy. It has to be in order to keep everything in it she needs. It has a wide door and a top that opens. The nice thing about this cage is that it is almost square. There are 3 chrome platforms in this cage, one large one in the back and two smaller ones on the sides. Two perches lie in front of the back perch so that she has a place to stand when she wants to; also, they prevent her from falling to the cage bottom. She walks slowly and carefully, but knows where everything in the cage is and gets around it very well. On the left side of the cage I have a small platform toward the front and a flat, round wicker mat toward the back. The wicker mat is supported by a perch underneath, and it clips to the cage bars on the right and left sides. I also anchor it with twist ties so it doesn’t move. Overtop these I place bar towels I have cut into fourths so that when I fold them lengthwise they fit perfectly. As you can see, they run from the front to the back. The back area is on a slant. That is accomplished by tilting the wicker toy up and anchoring it to the bars with long twist ties. I have placed a folded towel at the front of the cage on this “bed” to prevent her from falling through the gap and to give her a place to lay her head since she cannot tuck it under her wing unless she is leaning on something. Sometimes she climbs on the towel and uses the cage bars to support her body. You can see that in picture 6. On the right side of the cage is another platform and behind it a folded towel to keep her from falling through the gap and also to give her support when she is resting. She needs to keep her head up; if something isn’t there for her to support her head on, she lays her head on the flat surface. That is not good. I put her food and water in little crocks so that she doesn’t have to raise her head very much to access them. I also tie her millet spray on that side, low enough for her to reach without raising her head much. Her disability makes her sit low all the time. She doesn’t play much with toys, but I put some in there just in case she’s interested. I change them around just as I do for the other birds. They have to be small, though, so she doesn’t have to try to maneuver around them and, as a result, possibly fall. I put paper towels down on the large back platform because that’s where her wet and dry foods are placed. I anchor them with binder clips and place unclipped paper towels on top for easy cleaning. She gets a dry cereal/pellet/crumble mix on that platform, and it stays there all day. She loves this mix and having it on the paper towels makes it very easy for her access. She can hear me make it up each morning and hurries to the platform, waiting for me to put it down. I give them scrambled eggs some mornings, and that is placed on there too. Any soft foods are placed on there; the unclipped paper towels make clean-up very easy. In picture #1, you will see a resting area for her on the counter. I place a long block of balsa wood against the backsplash, then lay a mesh climbing toy on that so the head area is raised. A bar towel covers that, and under the climbing mesh I place another towel for stability on the countertop. She alternates between resting on that, flying to the orbiter a few feet away, being on my shoulder, the sofa, in Marcie’s cage or her own. She can’t maintain any position for very long, and it takes her a long time to get settled in one place. Pictures 7 and 8 show her on the resting place and on her bed platform. I place her food under her face, wherever she is, so she can eat without having to travel very far. She needs to move, so sometimes, if she’s moving around more, I’ll put it a few inches away from her, on that bath towel, and have her move to it. It all depends on how she’s doing that day. The fresh food always goes under her face or she’d never touch it! Because of the way she sits, she tends to get a sore area on her tarso-metatarsis, or back of the foot; so I rub Gentamicin Sulfate cream (Perrigo, 1%) into it every night. The soft towels help to keep it under control. Since she’s a lutino, she tends toward some Lutino Syndrome difficulties, especially the bald patches on her head and joint areas. She also has cataracts, the cause of her blindness. She tends to stay where I put her, so I have to make sure she gets enough food and water (water from a syringe) and is moved about at least once an hour. She also enjoys sitting on that circular woven toy in picture 1. I like her to do that since it puts her feet in a different position. Winnie, just rescued July 8, came to me with very poor mobility, cataracts, and one wing tip which had been bleeding often due to his striking it onto the cage bars. I allowed him to be in his roomier cage for a few days, but when I saw how difficult it was for him to stand and to keep his balance, I moved him into a bin. The bin is lined with towels, and they are covered with paper towels for easy clean-up. The bins also work well for birds who are ill and need more warmth, as he did the first week or so. I put a heating pad on the bottom of the bin and layer as many towels as needed until I’m comfortable with the amount of heat the bird is getting. Some birds will attempt to climb up and out of the bin, so I usually pack towels into the openings on the sides to prevent that. I also cover the top with a very large wicker doily and anchor the corners. A piece of screening inside a wood border works well too. I don’t have to do that with Winnie; he doesn’t have the ability to climb. I place his small crock of water near him, but I still give him water from a syringe or the liquid Emeraid mixture every couple of hours. He tends not to go to the water dish on his own; it takes too much effort. I put his dry food mix, millet and seed right on the paper towels so he can reach it easily. You can just barely see his water crock in picture #7. Marcie is the youngest of these four birds, probably around 10, and must be protected from falling. As you can see, there are barricades on the counter to prevent falls, and inside, she has many toys which get changed often and which she enjoys. Towels are placed on the counter for easy clean-up, and her food and water are placed there too. The cereal/pellet/crumble mix is placed on the towels. She takes the occasional bath there too. If she goes on the table, the other counter, or anywhere else off the floor, the barricades are moved to enclose the space. She is unable to fly due to failure of her wing and tail feathers to grow sufficiently well. Also, her wing muscles are weak, so we work those by having “flying lessons” on the bed. She has suffered since I got her 5 years ago with skin diseases, fungal and bacterial, but now with the help of the collar, she is growing in some beautiful feathers. She was allowed to shed the collar for her photo op! She’s even getting a tail in! 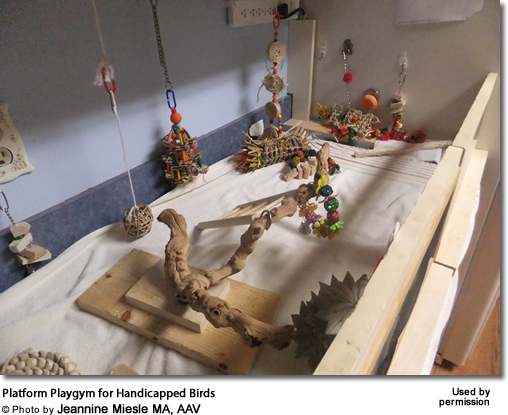 I hope these pictures and descriptions have given the readers some ideas on how to protect and care for their handicapped birds.